Color material is blended with the concrete mix to color the aggregate throughout. Many of the colorants are iron oxides and can create colors including blacks, yellows, and reds. Greens can be achieved using chromium, and ultramarine can be used to create variants of blue. Patterns are impressed into wet concrete slabs or overlays to create textures or to provide the appearance of brick or stone. Dyes are not chemically reactive with concrete, and their appearance is translucent. They can be organic or inorganic and diluted with either water or solvents. Stain colors are more intense if stain is applied soon after concrete has been placed. 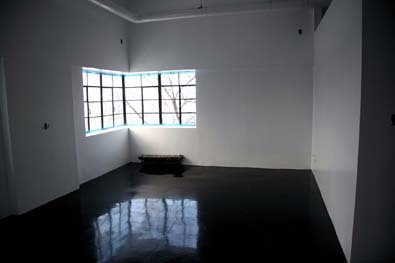 They can create bright colors not possible with stain, such as reds and yellows. Some dyes are UV-resistant, but those that aren't can be coated with UV-resistant sealers to make them colorfast. Acid staining is not a dyeing or pigment-base coloring system, but a chemical reaction. A mixture of water, salts and acid is applied to the concrete surface and later neutralized by a basic solution of ammonia, TSP (trisodium phosphate) and/or water. This chemical reaction with the existing minerals in the concrete creates new colors on the concrete surface. Due to inconsistencies in the surface of concrete, acid staining creates a variegated or mottled appearance that is unique to each slab. The thickness of this color change ranges from 1/16th to 1/32nd of an inch. Exterior concrete surfaces may not color as well as interior surfaces because the environment has leached or percolated out the mineral content. 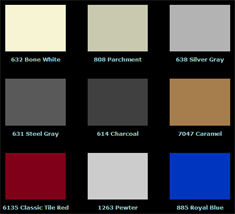 A few things that are important to keep in mind with acid-based stains, wide color variations are normal. Surfaces will have a mottled, variegated appearance, and these variations will be emphasized when the final coat of sealer is applied. With some acid stain colors, what you see in liquid form may not be what you get once the stain has reacted with the concrete surface. The stain may not reveal its true color until it has been allowed to remain on the concrete for several hours or longer. Always apply the stain to a small test area before covering the entire surface. Color effects will generally be more intense on new concrete than on older or weathered concrete. Even when treated with the same staining product in the same shade, no two pours of concrete will look alike due to factors such as the composition and age of the concrete, surface porosity, texture, and environmental conditions. It's this variability, rather than uniformity, that gives stained concrete its broad appeal and permits an infinite array of special effects. 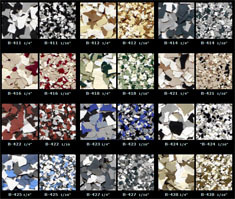 Products like decorative quartz and decorative flake provide an upscale image. Recommended for areas like restrooms and cafeterias decorative quartz combined with integrated coved base creates three dimensional stone appearance through its use of quartz aggregates and clear resins. The addition of decorative flakes give a terrazzo like appearance to our coatings and resurfacers. Our integrated logos create a real impact.